As with every major Windows 10 update, Creators Update is also in the ‘scrutiny mode’ right now having been released for almost 2 weeks now – if we include the initial rollout week. This means we will be seeing a number of user reports, some of them happy, most of them coming from disgruntled users who don’t appreciate one feature or the other. Valid criticism or the fact that many of us don’t like things to change, it is undeniable that much of the Windows 10 criticism comes from the number of notifications that Microsoft displays on the screen. As compared to Linux or macOS, Windows – and specifically Windows 10 – has a thing for nagging notifications. Whether it was forced upgrade notifications that were displayed to Windows 7 and 8 users in the first year of Windows 10’s launch, security warnings, or battery recommendations – the list is endless. Windows 10 Creators Update – yet another story of nagging notifications? 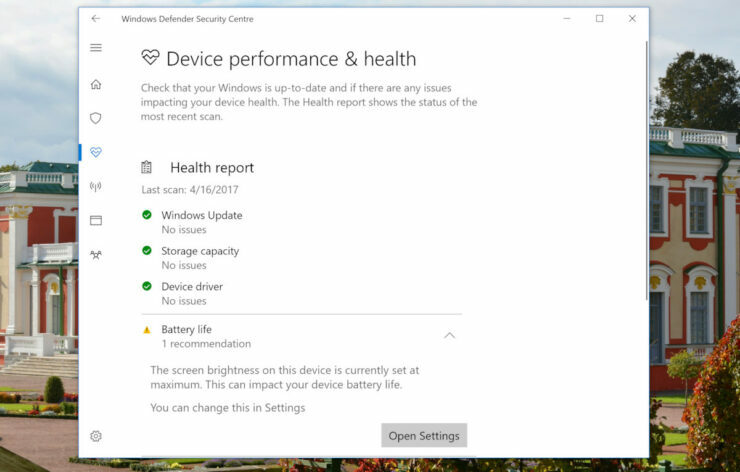 Following the release of Windows 10 Creators Update, Windows Defender now acts more like your dentist than a virus detector. The virus checker is now a full PC health app that, among other things, has been showing notifications to users who have set the screen brightness to the maximum 100%. Microsoft’s Battery Life Recommendation considers this setting as a battery drain issue, which is okay since that’s true. But then it goes ahead to consistently display a warning badgering users who like their system tray to stay clean. The warning also doesn’t make sense when it still shows up while your computer is plugged in, making it nothing but another annoying nagware. (Several users have reported this Windows 10 battery alert, but I couldn’t replicate this warning on my own PC.) This particular notification has led one Windows 10 user to flee the OS to the Linux community. Now before our Windows fans here start to nag this adventurous soul, he did appreciate several Windows 10 features in his post on Reddit. “I enjoyed face login on the SP4, Bash on Windows is quite a software engineering feat, etc,” he wrote. “Further, looking at Microsoft as a whole, they are doing a lot of cool stuff.” He continued his post detailing why did then he make the decision to move to Linux. Then what pushed me towards Linux? General instability since Windows 10. Some examples: 1) Anniversary Update led to high CPU usage on my SP4 unless I turned off face login, took them three months to fix the issue. Discussion thread on MS support forum. 2) USB 3.0 device instability on two X99 motherboards, causing system freezes and restarts, detailed symptoms described here. All symptoms disappeared after switching both builds to Ubuntu. In all fairness, it was likely a driver issue (though both drivers from MS and drivers from vendor failed) rather than Windows’ own fault. The fact that those faults weren’t experienced on Ubuntu still left me sour with Windows. Of course, he couldn’t resist saying that his opinion won’t be a popular choice. “‘Switch to Linux’ is an unpopular option to raise in a Windows centric subreddit, as the downvotes on my previous comment indicates [sic]. But it is still a valid option for certain people. If any of you reading this are unsatisfied with Windows, and if Linux fits the bill for your use case, give it a shot,” he dared to invite others to the other side too. While this particular solution appears to be drastic and may indeed not be a popular choice among Windows fans, but it yet again shows that Microsoft is a long way from stopping to annoy its Windows 10 users unnecessarily. Before you head over to Linux, though, folks at MSPU suggest setting screen brightness to 99%, which will help you get rid of this particular notification.